You may have seen the array of whitening products that you can buy at your local grocery store, but many of these items don’t provide you with results. That’s where professional teeth whitening comes in. Your dentist will use a completely safe, high-powered bleach with a special light to activate it. This ensures that your whitening treatment removes stains that are below the surface, giving you a smile that is up to 8 shades whiter. The best part is that this treatment can be done in one easy, quick, and affordable dental visit. Safety: Many patients find that their gums feel irritated after using over-the-counter whiteners. That’s because these products aren’t customized to fit their smile. With in-office whitening, your dentist will carefully whiten your teeth in the safest way possible. Effectiveness: As mentioned above, you can see a dramatic change in the whiteness of your teeth. Additionally, your dazzling brightness will last longer after treatment than with over-the-counter products. Speed: Probably the most impressive benefit, you can achieve the same level of whiteness that weeks or even months of at-home whitening would achieve in just one visit that lasts about an hour. How Can I Keep My Smile Pearly White? Avoid drinking liquids that stain like coffee, wine, and other foods or drinks that are rich in color. If you drink liquids like wine or food like spaghetti sauce, rinse or brush your teeth right after to prevent staining. Try to avoid smoking because tobacco can discolor your teeth. Maintain a good oral health routine including brushing, flossing, and even using mouthwash to keep your smile clean and healthy. Visit your cosmetic dentist for touchup treatments to keep your smile white and dazzling. 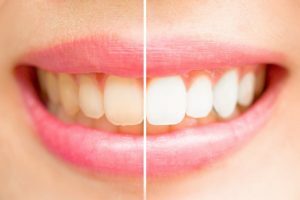 Now that you know some amazing benefits of in-office teeth whitening and how to keep your smile shining, contact your dentist to get started on a beautiful grin. At Lake Oconee Dentistry, we have a team of 5 dentists who each have a passion for quality care. They take pride in offering teeth whitening to give their patients a boost in smile confidence. For any questions, they can be reached through their website or by phone at (706) 453-1333.